Casey McKinney joined us October 4 on LVA's Artebella On The Radio to discuss his current exhibit, When Elements Collide, at Mellwood Art Center’s Pigment Gallery. Casey is also a sculptor and muralist and you will see examples of both at Mellwood. Tune in to WXOX 97.1 FM/Artxfm.com at 10am each Thursday to listen to artists talk about their work. Because the host forgot to start the archive recording, the recording picks up about 20 minutes into the hours. Sorry Casey. Louisville Visual Art has forged a new and dynamic partnership with Google Fiber. Together, we commissioned artists for three murals celebrating Louisville's diverse neighborhoods and unique culture. 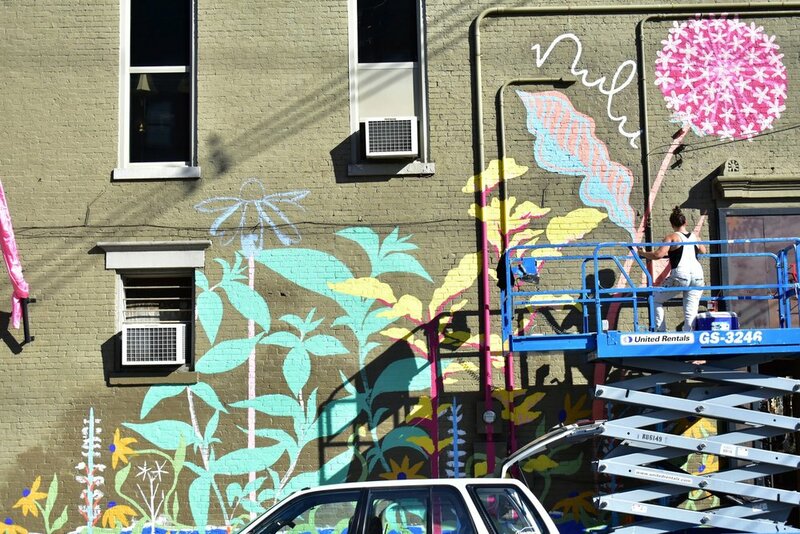 After receiving submissions from more than 70 local and regional artists, LVA and Google Fiber collaborated to select three very talented locals, all working in very distinct styles, to bring more color to different Louisville neighborhoods. Finalists were invited to submit a site-specific proposal for one mural each. The mural designs reflect each artist's vision of Louisville's diversity, independence, and optimism. The three artists are Carrie Donovan, Liz Richter and Carlos Gamez de Francisco. Carrie Donovan worked in Portland at The Table restaurant in the Church of the Promise building (1800 Portland Avenue, owned by Kathie & Larry Stoess). “'Portland flows with promise'” is a phrase that represents all that happens in the Promise building," Donovan said. "The shapes connect the different aspects of their work, and the banner and the type express the idea of 'flow' — like the river, and like the way their work flows into the community." 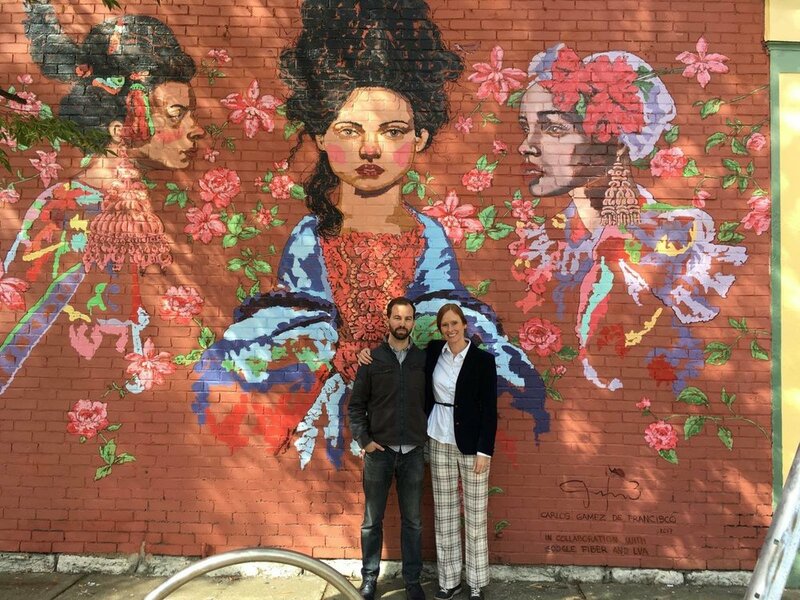 Carlos Gamez de Francisco brightened up a wall on the side of the Nitty Gritty vintage clothing store (996 Barret Ave., owned by Terri Burt) in the Highlands. He sought "to give visibility to one of the most important features of the people of Louisville: acceptance, respect, and tolerance to others," he said. Burt is thrilled by his work and said, "Everyone loves it. I actually have people coming into my business to tell me how cool the mural is on the building. My business neighbors love having it represent the 'hood." Gamez de Francisco 's folkloric style is synergistic with the colorful and eclectic feel of this neighborhood, and his images reference different immigrant cultures represented in Louisville. Burt added, "The building is much more noticeable. It has become a conversation in the Louisville art scene." Liz Richter added to the growing mural movement in NuLu on the side of Red Tree Furniture (701 E. Market St., owned by Garwood Linton). "I believe my design will help elevate the local culture as it relates to the mural scene by providing an example of a different kind of street art then what is seen around town, and from a distinctly feminine perspective. I want to make this mural bold, exuberant and engaging," Richter said. Her Kentucky Wildflower is "signifying the growth of local businesses and freethinking individuals. Overlapping, interdependent blades and flowers illustrate a community of connectivity." Support from corporate partners, like Google Fiber, for public art projects celebrating distinct local perspectives has a significant impact on both neighborhoods and the business community.